هاوارد ويب اللى حكم فى نهائى ماتش كاس العالم 2010, طلع 14 كرت اصفر وبرضه طلع كرت احمر وحده بس, واللى حطم رقم قياسى اللى يوزع بطاقات فى مواجهه نهائى ماتش كاس العالم, فى نهائى كاس العالم 1986 كانت تطلع 6 بطاقات بس. ↑ "Howard Webb's journey - From Rotherham policeman to World Cup 2010 final referee". Goal.com. 8 July 2010. Retrieved 16 February 2017. ↑ "Sunderland manager Bruce praises referee Webb". BBC Sport. 12 July 2010. Retrieved 15 January 2014. 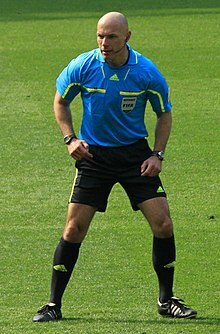 ↑ "Howard Webb given honour of refereeing World Cup final". The Guardian. London. 8 July 2010. Retrieved 8 July 2010. ↑ Fifield, Dominic (12 July 2010). "World Cup final: Howard Webb's dream job descends into nightmare". The Guardian. London. Retrieved 12 July 2010. الصفحه دى اتعدلت اخر مره فى 21 مايو 2018,‏ 10:28.